, a celebrated popish writer, descended from an ancient and honourable family, seated formerly in Nottinghamshire, but before his time it had removed into Yorkshire, in which county he was born, at Wakefield, in 1605. 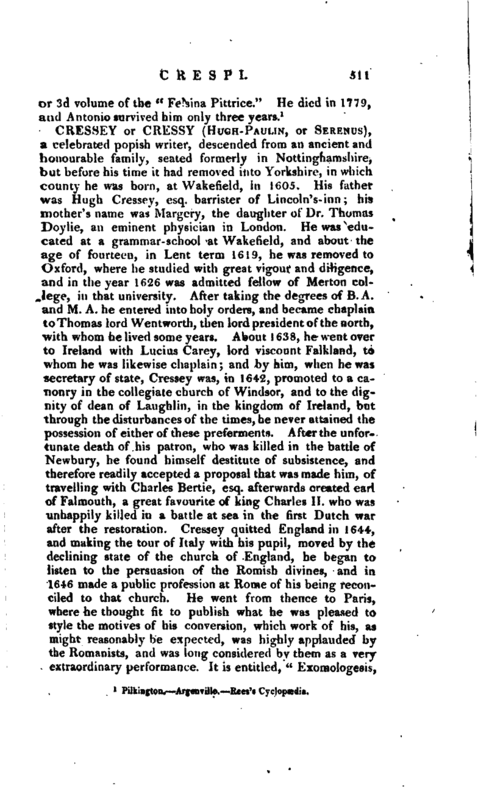 His father was Hugh Cressey, esq. barrister of Lincoln’s-inn; his mother’s name was Margery, the daughter of Dr. Thomas Doylie, an eminent physician in London. He was educated at a grammar-school at Wakefield, and about the age of fourteen, in Lent term 1619, he was removed to Oxford, where he studied with great vigour and diligence, and in the year 1626 was admitted fellow of Merton college, in that university. After taking the degrees of B. A. and M. A. he entered into holy orders, and became chaplain to Thomas lord Wentworth, then lord president of the north, with whom he lived some years. About 1638, he went over to Ireland with Lucius Carey, lord viscount Falkland, to whom he was likewise chaplain; and by him, when he was secretary of state, Cressey was, in 1642, promoted to a canonry in the collegiate church of Windsor, and to the dignity of dean of Laughlin, in the kingdom of Ireland, but through the disturbances of the times, he never attained the possession of either of these preferments. After the unfortunate death of his patron, who was killed in the battle of Newbury, he found himself destitute of subsistence, and therefore readily accepted a proposal that was made him, of travelling with Charles Bertie, esq. afterwards created earl of Falmouth, a great favourite of king Charles II. who was unhappily killed in a battle at sea in the first Dutch war after the restoration. Cressey quitted England in 1644, and making the tour of Italy with his pupil, moved by the declining state of the church of England, he began to listen to the persuasion of the Romish divines, and in 1646 made a public profession at Rome of his being reconciled to that church. 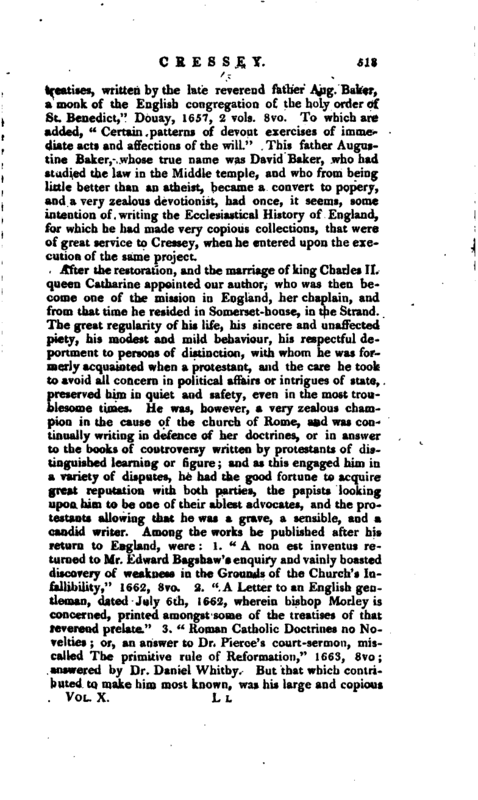 He went from thence to Paris, where he thought fit to publish what he was pleased to style the motives of his conversion, which work of his, as might reasonably be expected, was highly applauded by the Romanists, and was long considered by them as a very extraordinary performance. It is entitled, “Exomologesis, | or a faithfal narration of the occasions and motives of his conversion to Catholic Unity,” Paris, 1647, and 1653, 8vo. 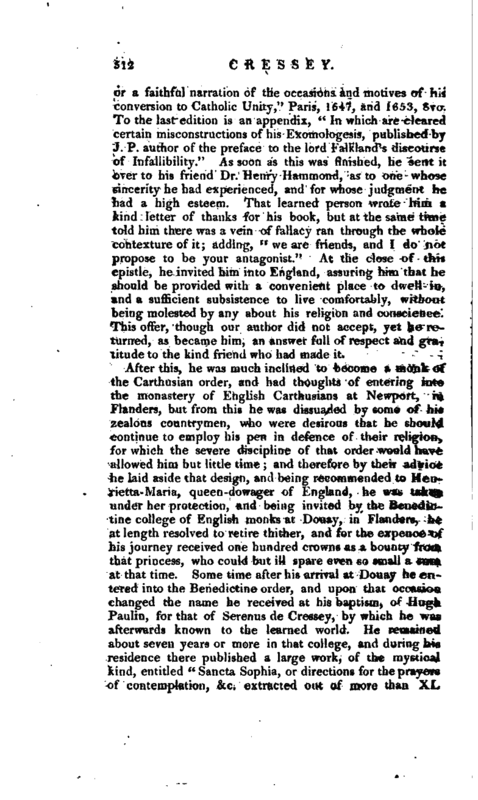 To the last edition is an appendix, “In which are cleared certain misconstructions of his Exomologesis, published by J. P. author of the preface to the lord Falkland’s discourse of Infallibility.” As soon as this was finished, he sent it over to his friend Dr. Henry Hammond, as to one whose sincerity he had experienced, and for whose judgment he had a high esteem. 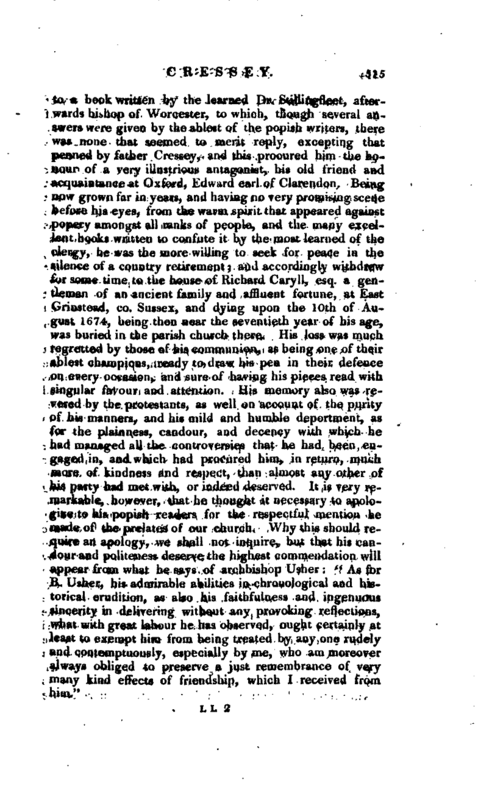 That learned person wrote him a kind letter of thanks for his book, but at the same time told him there was a vein of fallacy ran through the whole contexture of it; adding, “we are friends, and I do not propose to be your antagonist.” At the close of this epistle, he invited him into England, assuring him that he should be provided with a convenient place to dwell in, and a sufficient subsistence to live comfortably, without being molested by any about his religion and conscience. This offer, though our author did not accept, yet he returned, as became him, an answer full of respect and gratitude to the kind friend who had made it. After this, he was much inclined to become a monk of the Carthusian order, and had thoughts of entering into the monastery of English Carthusians at Newport, in Flanders, but from this he was dissuaded by some of his zealous countrymen, who were desirous that he should continue to employ his pen in defence of their religion, for which the severe discipline of that order would have allowed him but little time; and therefore by their advice he laid aside that design, and being recommended to Henrietta-Maria, queen-dowager of England, he was taken under her protection, and being invited by the Benedictine college of English monks at Douay, in Flanders, he at length resolved to retire thither, and for the expence of his journey received one hundred crowns as a bounty from that princess, who could but ill spare even so small a sura at that time. Some time after his arrival at Douay he entered into the Benedictine order, and upon that occasion changed the name he received at his baptism, of Hugh Paulin, for that of Serenus de Cressey, by which he was afterwards known to the learned world. 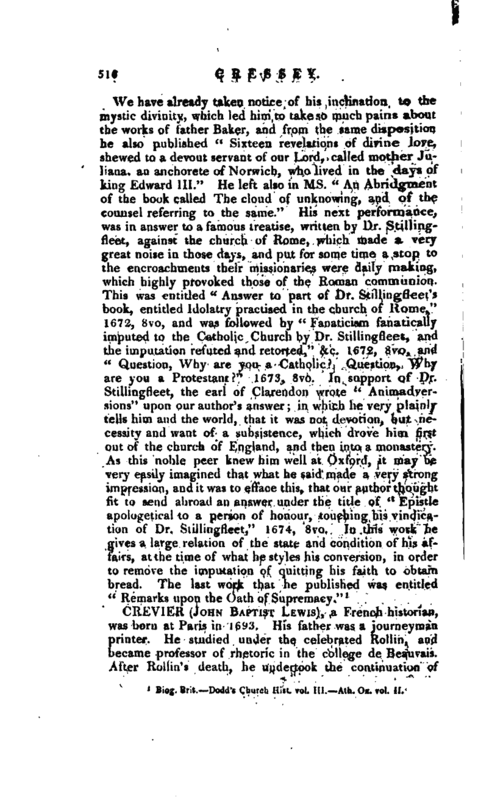 He remained about seven years or more in that college, and during his residence tnere published a large work, of the mystical kind, entitled “Sancta Sophia, or directions for the prayers of contemplation, &c. extracted out of more than XL | treatises, written by the late reverend father Aug. Baker, a monk of the English congregation of the holy order of St. Benedict,” Douay, 1657, 2 vols. 8vo. 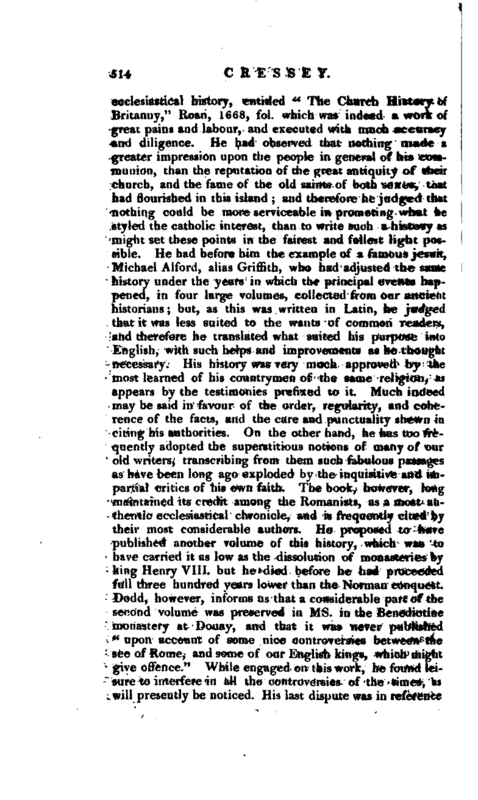 To which are added, “Certain patterns of devout exercises of immediate acts and affections of the will.” This father Augustine Baker, whose true name was David Baker, who had studied the law in the Middle temple, and who from being little better than an atheist, became a convert to popery, and a very zealous devotionist, had once, it seems, some intention of writing the Ecclesiastical History of England, for which he had made very copious collections, that were of great service to Cressey, when he entered upon the execution of the same project. Biog. Brit. Dodd’s Church Hist. vol. Iif.*-—Ath. Ox. vol. II.